In our Philadelphia Medical Weight Loss Center we know that starvation diets and totally cutting out certain food groups are not the healthy ways to losing weight and keeping it off. That’s why we use a sensible eating plan in our weight loss program. Along with our diet weight loss pills and appetite suppressant medications we teach you how to make the right food choices. And if you want to enjoy a piece Berry Shortcake or even a piece of cheesecake you can. Here are 2 great recipes that you can eat while on our weight management program. I hope you like them as much as I do. Begin this dessert by heating the oven to 425 degrees. In a large bowl mix together baking soda, sugar, and orange rind. Then stir in milk and 1 tsp of orange extract until a soft dough forms. Get your hands lightly floured and flatten mixture into a non greased 9 in round cake pan. Bake for 15 minutes, Remove cake and let cool. As the cake cools, use a large bowl to mix berries, fruit spread, and remaining orange extract. (Keep some berries aside for garnish). Let stand for 15 minutes. Cut shortcake horizontally in half, placing bottom half cut side up on a plate. Add 1 cup of whipped topping to cake, along with berries. Now place top cake half with cut side down on top of berries. Add ½ cup whipped topping to center of shortcake. Finally, garnish with remaining berries and mint sprigs. Enjoy! Start with using a small bowl to mix together vanilla pudding, milk and 2 tbs of light pancake syrup. Let refrigerate for 15 minutes, or until thickened. Now using a large bowl mix strawberries, blueberries, raspberries and remaining 2 tbs of light pancake syrup. Place your crepes on four different plates, adding ¼ of pudding mixture into the center of each crepe. Now top each crepe with ¼ of berry mixture and roll up. Top with 2 tbs of all-fruit apricot spread and little sprinkles of confectioners’ sugar. Enjoy! 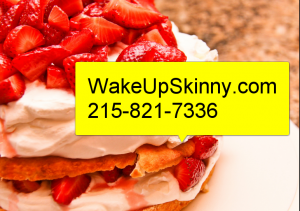 So there you have 2 great recipes to enjoy while still losing weight.Enjoy these recipes and if you would like to set up your free medical weight loss consultation call us at 215-821-7336. This entry was posted in Diet Doctors in Philadelphia, Medical Weight Loss, Medical Weight Loss in Philadelphia PA, Medical Weight Loss Philadelphia, weight loss philadelphia and tagged Medical Weight Loss Philadelphia, medical weight loss philadelphia video, weight loss philadelphia on September 8, 2016 by Dr. Michael Kenny.